In 1931, as part of the observance of the 75th anniversary of Seton Hall College, a major renovation of the Chapel was undertaken. Part of this renovation included the installation of new windows in the faÇade. The majestic three-lancet faÇade window, partially hidden by the organ loft, depicts the patrons of church music: Pope St. Gregory the Great, St. Cecelia, and King David. There are also two additional windows lower in the faÇade. Each is obscured; one by the stairway, the other by the unfortunately located "reconciliation room." The window by the stairway portrays St. Venantius and St. Pancras. The portraits of the other window are completely hidden from view. All that can be seen are the ventilators. The Maker's Mark can be seen at the bottom right of the right ventilator inside the reconciliation room. 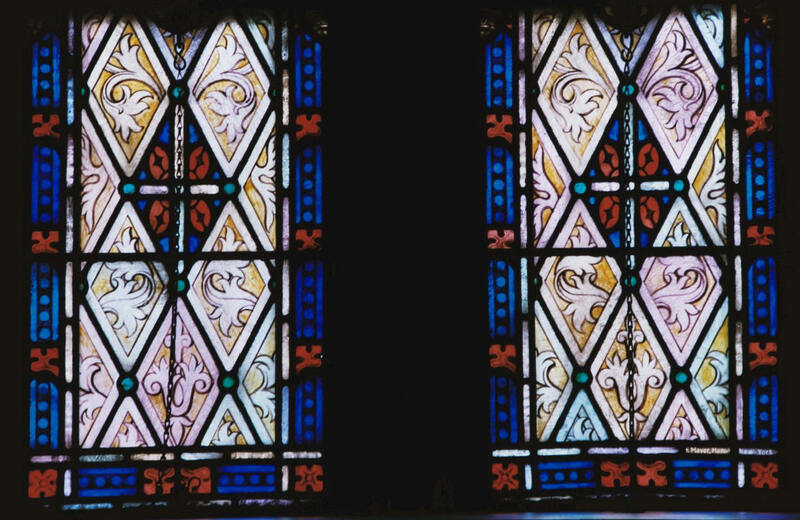 Like the nave windows, these windows come from the studio of Franz Mayer of Munich. Mayer's records record their installation.